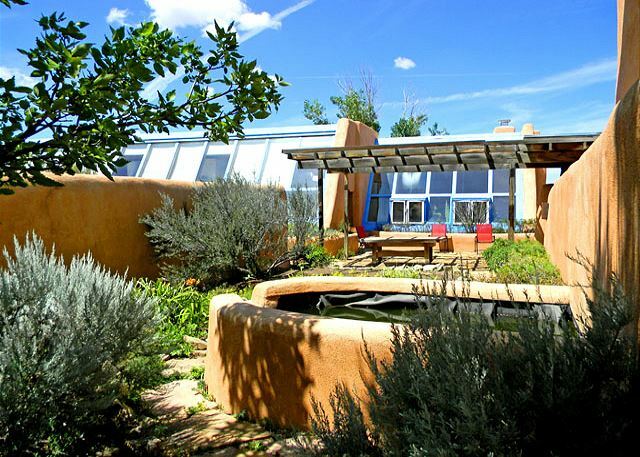 If "Earthship" is a new concept, you may enjoy reading the history that is one of many unique trends that made Taos so famous: Just google "Taos earthships" and learn about them and their founder, Mike Reynolds whose earthships are now world wide and inhabited bye some world renowned celebrities. Then, come and enjoy the upgraded refined version built by John Shaw in 1993.. You will return home with everlasting memories of a positively unique lodging Read on for specifics regarding John Shaw's House an advanced version of the original Earth Ships of the early 70's. 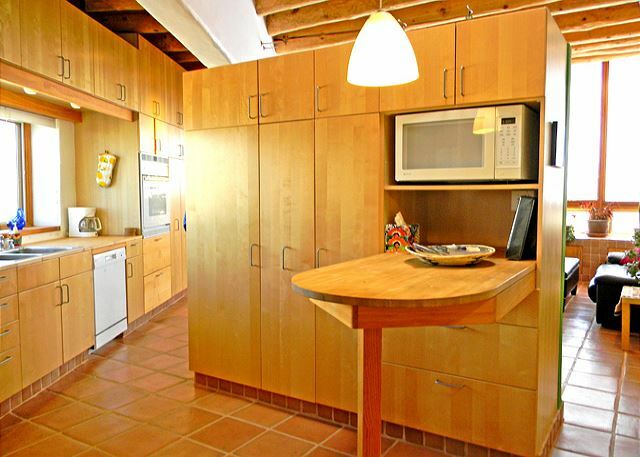 This compound, designed and built by a retired professor of architecture, comprises a main house, guest house, root/wine cellar, and a rotunda, all connected by six courtyards. The ensemble was conceived and built as an island in a rolling plain of sagebrush. Everything was carefully coordinated as a whole for both use and appearance, including structures, landscaped courtyards, enclosing walls, driveways and parking areas. The sagebrush comes up to the perimeter like waves to the shore. All structures and landscaping inside have a logical limit. There are no leftover, hard-to-maintain areas. 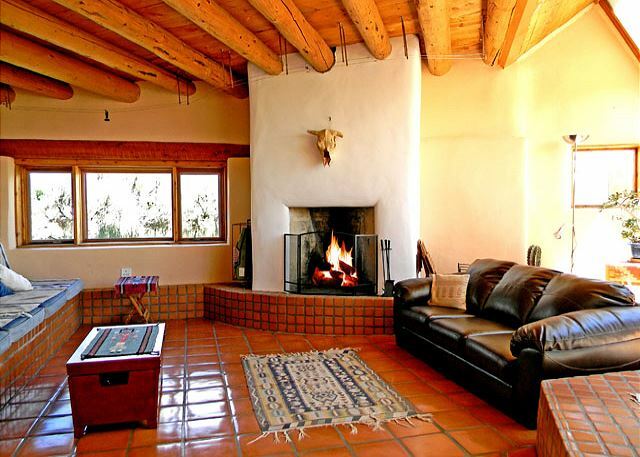 The compound is an updated interpretation of a Spanish hacienda with influences drawn from Taos Pueblo architecture. 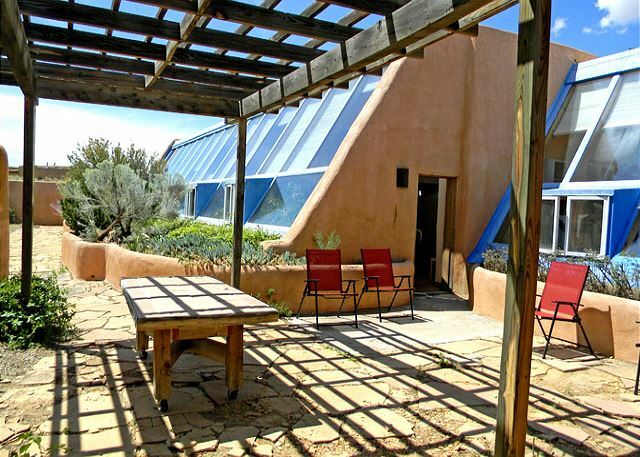 The main house was designed to use the construction system of an earth ship. It's earth-filled tire-wall construction provides thermal and structural mass and a sense of solidity. Despite the long, low outside profile of the entire compound, inside both houses have high ceilings along the entire length of light-filled glass walls, which extends the interior space visually into private courtyards and distant mountain views. Because the main house is sunk as much as four feet into the ground (providing excellent thermal insulation), the space opens dramatically to a height of 12 feet. Both the main house and guest house are open, light and spacious along the south side, with more closed spaces serving as insulation on the north. The design is site-specific in many ways. 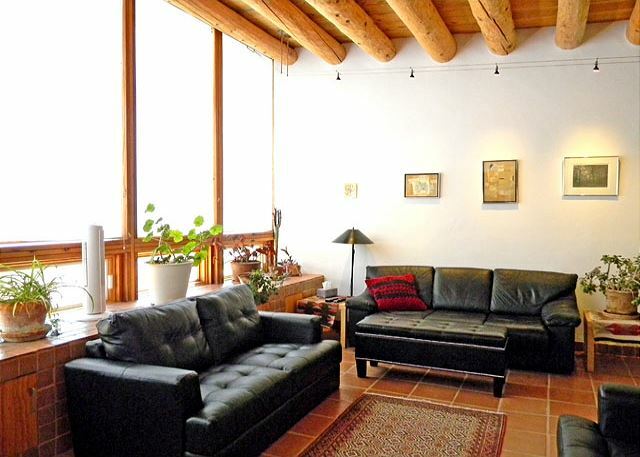 Taos Mountain, the view to the east, is carefully framed in large east facing windows in both houses. 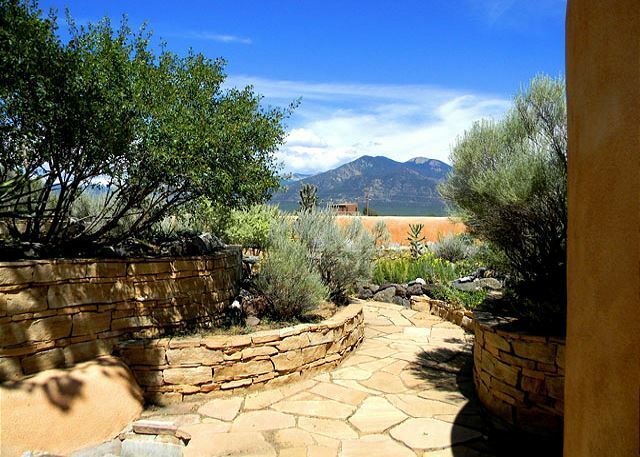 This same view of Taos Mountain is also highlighted in the entry courtyard. This courtyard also presents low walls to the outside, but as one descends either steps or ramp lined by rock gardens and native plants, the space becomes more enclosed from the outside world. Here one discovers a flagstone terrace and a fountain nestled in the garden, complete with a drooling dog head, sculpted by John Shaw, the architect of the compound. 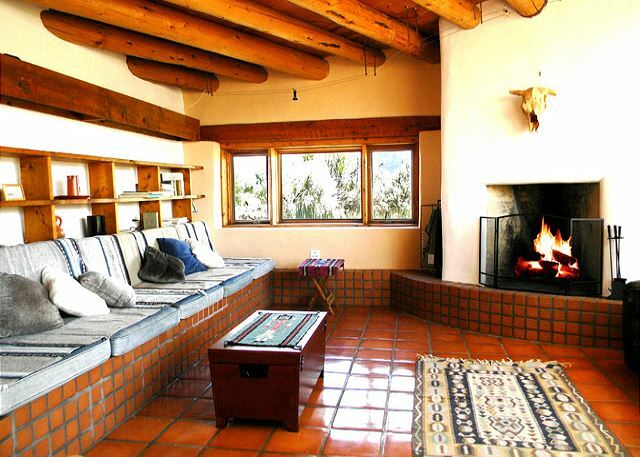 The properties six courtyards are an integral part of the household, just as in a traditional hacienda. 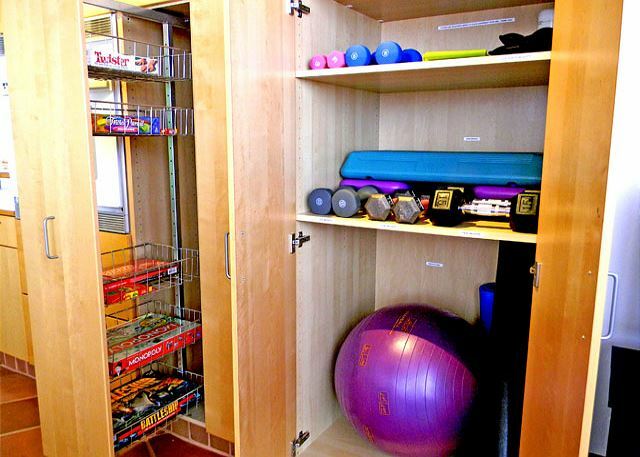 Each one provides a different experience and potential for use. The main south courtyard presents a low profile to the outside world, but from inside, that wall is seven feet high. It provides a wonderful setting for a potential lap pool and hot tub, some day in the future! 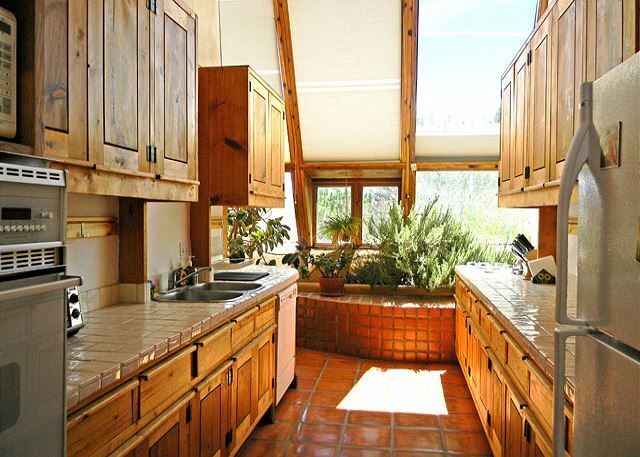 A "mesa," consisting of a platform inside the main house and a planter in the courtyard, runs through the glass wall, visually connecting inside and outside, as well as providing a greenhouse for year round use. A pergola at the east end of the main courtyard, provides sun and rain protection, and a sheltered area for grilling. The courtyard directly opposite, known as the " perspective garden" houses flower and vegetable gardens. It was built with a forced perspective, in that it looks longer than it is because the wall slope lower and the space is narrower at the back. It has a pool under a canale (Spanish for trough), which drains the guest house roof, and a path connecting to the back door of the guest house. Dear Zachery, Thank you for taking the time to describe your vacation experience at "John Shaw's House". We love hearing from extatic guests and we feel the same about this lovely home. "There was no way to capture it with photos alone". One has to walk in and test it for themselves. 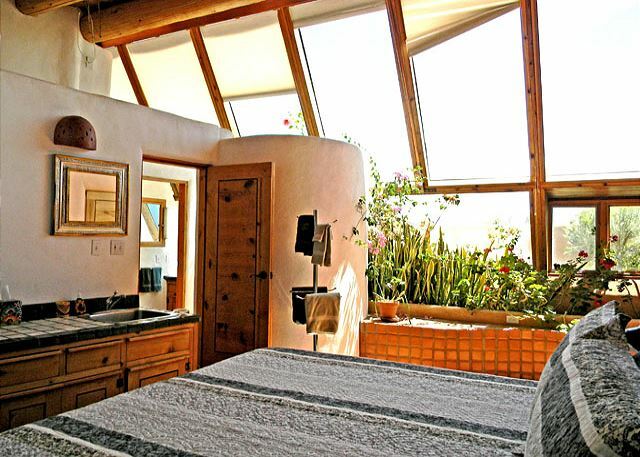 John Shaw was an exceptional architect himself and he dared to make impactful improvements to the original earthships that put Taos on the international "Do not miss" vacation list. 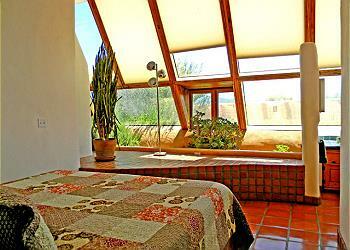 The John Shaw Earthship and Guest House were great. We had eight people, and fit very comfortably. We absolutely loved the house and the grounds, including the fireplace and the large kitchen. Both the guest house and main house were well maintained with easy access to the outdoor enclosed areas. Interiors were light and bright, unique & enjoyable. Would highly recommend to all who are looking for that "something different". 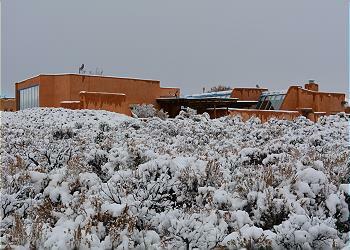 Was well located as a "hub" going out to all the areas around Taos, NM - Dan J.
AMAZING! Overall Satisfaction = A Service = A Cleanliness = A Property Condition = A Location = A Would refer to others = Yes - Andreas C.